"You discovered a walking, talking dummy and you didn't tell me?!" Sony Pictures has debuted the first trailer for horror comedy sequel Goosebumps 2: Haunted Halloween, based on R.L. Stine's book series known as Goosebumps. This is the follow-up to the 2015 live-action Goosebumps movie that didn't get great reviews, and it looks like it's even worse. They decided not to bring back Jack Black as R.L. Stine (aside from his voice), and instead they're telling another CGI-filled haunted story this time around. The ensemble cast of Goosebumps 2 includes Ken Jeong, Wendi Mclendon-Covey, Chris Parnell, Madison Iseman, Ben O’Brien, Caleel Harris, Jeremy Ray Taylor, and Jack Black as the voice of Slappy. Others from the first movie might appear as well, but are not confirmed yet. This doesn't look like it will impress anyone. "No one does Halloween like Slappy." Halloween comes to life in a brand-new comedy adventure based on R.L. Stine’s 400-million-selling series of books. The sequel to the first live-action Goosebumps movie from 2015. 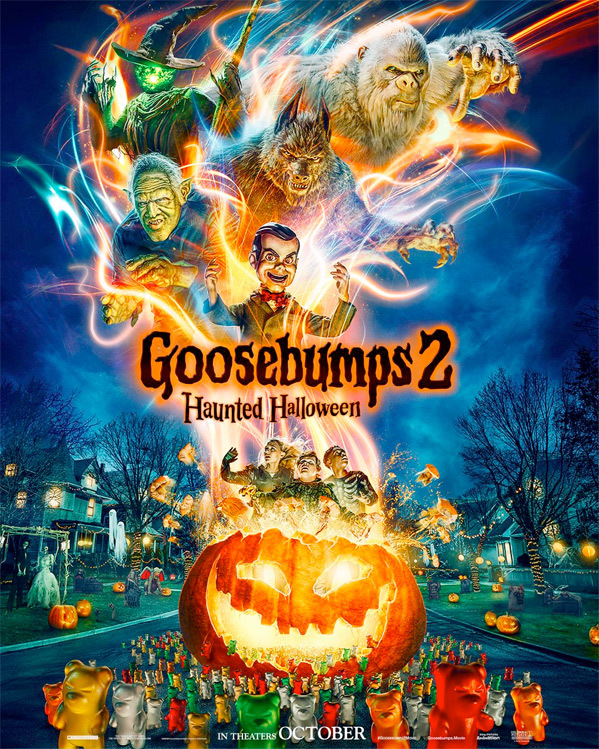 Goosebumps 2: Haunted Halloween is directed by American filmmaker Ari Sandel, director of the films The DUFF and When We First Met, as well as the TV series "Aim High" previously. previously. The screenplay is written by Rob Lieber. It's produced by Deborah Forte and Neal H. Moritz. Adapted from the Goosebumps book series written by R.L. Stine. Sony Pictures will release Sandel's Goosebumps 2: Haunted Halloween in theaters everywhere starting October 12th this fall. First impression? Is anyone interested?